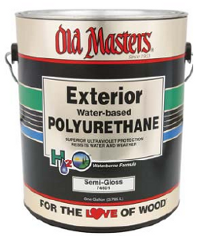 Protect the beauty and integrity of exterior surfaces with Old Masters® Exterior Water Based Polyurethane. This crystal clear exterior application can be used on wood, fiberglass, or steel and contains Ultra Violet Absorbers for advanced sun protection. Non?toxic, this product is child safe when dry and cleans easily with soap and water. Use on wood surfaces such as outdoor furniture, fencing, and gables, as well as wood, fiberglass, and steel doors. At recommended dry mil film thickness coverage will be 230?470 sq. ft. per gal. Apply when air and surface temperatures are between 60 and 90F and humidity is between 30% and 70%. H2O EXTERIOR POLYURETHANE will dry to touch within 30 minutes and ready to topcoat after 1 hour. Wait 24 hours before subjecting surfaces to light use. Care should be used during the first week after application as the finish is still curing to its ultimate hardness. Drying time will be affected by temperature, humidity and film thickness. Do not apply in direct sunlight or areas of extreme air movement. Protect product from freezing prior to and during application. Wash brushes and equipment in warm, soapy water and rinse with water.